With a shallow pool of QB options in the draft and free agency the Kansas City Chiefs completed a trade with San Francisco to acquire, former number one pick, Alex Smith. The cost for Smith’s services to come to KC was their second round pick (34th overall) and conditional picks in the 2014 draft. Smith has had a stellar turn around from his early career woes, over the last two seasons Smith has a record of 19-5-1. Whereas the Chiefs have gone 9-23 and have a new coaching staff and general manager. Many would attribute Smith’s newfound success to 49ers head coach, Jim Harbaugh’s QB friendly offensive scheme. After suffering a concussion in a game midway through the season, Smith was supplanted by the versatile Colin Kaepernick. Making Smith an acceptable loss and a cap casualty. Smith has had minimal actual success away from Harbaugh’s offensive game plans. Making this trade a high-risk one for the Chiefs, considering Andy Reid’s deep ball loving offense. When it comes to shallow and medium range passes, Smith can make those any day of the week. His game is weak when it comes to the deep ball. With KC’s lack of receiving depth (Dwayne Bowe is a free agent), this trade has all of the ingredients for a bust against KC. Before Harbaugh arrived in San Francisco, Smith had a 51 passing TDs and 53 INTs in his career. In the two years since Harbaugh came on the scene Smith has thrown 30 TDs and only 10 INTs, further proof that Harbaugh was the right guy in the right place for Smith’s career. Increasing Smith’s trade value, with the rise of Kaepernick as the starter for the 49ers. Kansas City has created a track record for picking up QBs either on the rebound through free agency or trades. Their incumbent starter, Matt Cassel, is in the final two seasons of his six-year contract he signed, after being traded from New England and has floundered as the guy for KC, starting 18 games over the last two seasons. Smith is the next in a long line of Chiefs QBs who will have the arduous task of bringing the Chiefs back to glory. The Chiefs offer of their second round pick is a bit high, given with the lack of production from Smith before the arrival of Jim Harbaugh. With the newly acquired second rounder, this gives the 49ers the 31st and 34th overall picks. San Francisco will probably use these picks to stack their, already elite defense. Whereas the Chiefs have a guy who has had limited success in seven years of NFL service. Kansas City has the number one overall pick in the upcoming NFL Draft (April 25th) and had been projected by many to take West Virginia QB Geno Smith and would have made him the first QB drafted by the Chiefs in the first round since 1983. The Chiefs were highly interested in current head coach Andy Reid’s pet project in Philadelphia, second-year QB Nick Foles, but the Eagles brass wanted much more than many would deem reasonable. 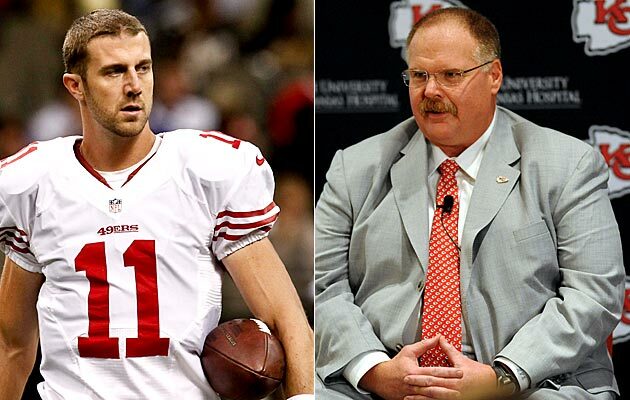 So they went with the next best (but better option) of Alex Smith. Smith lead the 49ers to the NFC Championship game in the 2011 season and had a 6-1 record before being replaced by Kaepernick this past season.